Kitchen Chick: "Angel-Cake Surprise for your fanciest party!" "Angel-Cake Surprise for your fanciest party!" My friend P invited us to her fabulous 1950s party. She was cooking all the savories — three kinds of meatloaf, delicious home-made mac & cheese, boiled veggies (how '50s! ), salad, buttermilk biscuits — and retro desserts like pudding and jello. (It can't be the 1950s without jello.) She invited the rest of us to bring additional desserts. 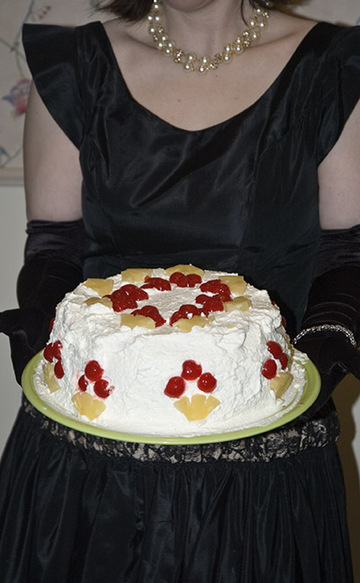 I wanted to make something that fit the theme, yet also looked pretty and tasted good, unlike some 1950s delicacies. So I pulled out Joe's 1953 edition of the Better Homes and Gardens New Cookbook and was stopped dead in my tracks by the above photo (which I have scanned in for your viewing pleasure). "Angel-Cake Surprise for your fanciest party," read the header. "Listen to the "oh's" and "ah's" as you cut through the whipped-cream frosting and light, tender angel cake and find a tempting whipped cream, nut, and fruit surprise filling." "Oh's" and "Ah's". Indeed. If there's one thing I love about early to mid 20th C cookbooks, it's how they describe the food. I truly hope that my nephew and godson's generation has as much fun reading today's cookbooks 50 years from now as I get out of reading the cookbooks from my grandmother's days. Scary-looking. Then I read the ingredients. Whipped cream and more whipped cream. Hmm... one of my favorite ingredients used in abundance. A bit of fruit. Some nuts. Marshmallows. And NO jello. (I hate jello.) Angel-Cake Surprise was sounding better and better. Reader, I baked it. And, truth be told, it was tasty! If you like whipped cream and ambrosia, you'll like Angel-Cake Surprise. 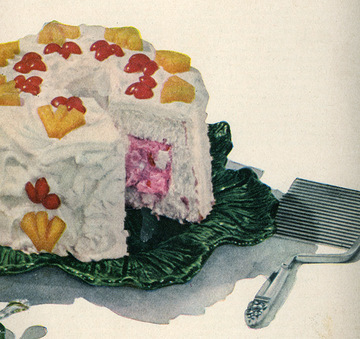 It was a sweet, fluffy, creamy, and lightly refreshing dessert in a retro 1950s way. You can bake your own angel food cake from scratch using any recipe out there. I used a boxed mix. Much easier, and I didn't have to figure out what to do with all the extra egg yolks. Whip the cream with sugar and vanilla. Fold in other ingredients. Add small amounts of maraschino cherry juice until the desired level of pinkness is achieved (but don't let the filling get "watery"). Chill. Cut out a ring about 2 inches wide and 2 inches deep. 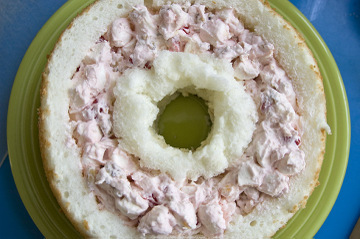 Do this by cutting the outer and inner circles of the ring, and then carefully pull out the angel food cake to make the trough. Do not immediately eat the bits. Save the bits in case you need them for structural repairs, then eat the excess. Spoon in chilled filling. Use reserved bits of angel food cake to repair the cake or build up the center ring as needed. Replace the top and frost with whipped cream (next step). Whip cream with sugar. Cover cake in whipped cream. Chill. Before serving, decorate with pineapple and cherries. Kitchen Chick's notes: I used pineapple in its own juice, and not in heavy syrup. I suspect that back in 1953 they used pineapple in heavy syrup, which is a bit darker. Pineapple chunks are rather, well, chunky and thick, so I used canned pineapple rings and cut my own sections like in the photo. My center ring sunk a bit in height, so I found it useful to use the extra bits Joe hadn't swiped to build up the ring (below photo). I came, I saw, and I ate some. And it was very, very good. Angel food cake + whipped cream = heaven. Thanks for making it! If I didn't have somewhat of a weight problem, I would have eaten the whole thing!!!! How fabulously retro! I loved the presentation, too. Actually, there was something similar, I think, in this issue or last issue of Cook's Country. That looks fabu. I can't help but think about it being a good thing that a safer red dye has been found since this recipe was published...there was, what?, maybe going on a decade there in which this would have been hard to do because maraschino cherries were not readily available. What a stunning addition. I love it! I am in awe. So is your nephew who points, repeatedly, and says: "I want THAT cake! MY cake!" Hello from upper michigan. Mmm that cake looks amazing. I wouldn't mind trying this sometime. I remember my mother making one of those when I was a boy. Yes, I am a true child of the Fifties. Mickey Mouse ears and Davy Crockett coonskin included. However, I begged Mom to make another of these delights and she never did it again. I guess she thought it was too much work. There might be no more ominous phrase than "Reader, I baked it." Thanks for this! I want to make it for my Exchange Student daughter's birthday when she comes to visit from Germany. When I went to my vintage BH&G cookbook to refresh my memory about what goes in the filling, much to my horror, page 126 was missing! You saved the day!! My sister and I share a birthday, and this has been THE cake for 50+ years. Mom would freeze the cake after putting it all together, and we never needed ice cream. Pineapple tidbits work well for the garnish - easier than chunks. I've made this cake for my husband's birthday every year for 30 years. I started by reading the recipe,but when I "lost" it, I would just "wing it"because I knew it be heart. I just felt like going back to the original, and I'm glad I did. Can't wait to make it again. His birthday is Dec. 9th.